A temper tantrum is a child’s way of handling a frustrating situation by acting out, screaming, crying yelling and oftentimes throwing themselves on the floor. Yes, it’s very dramatic and most toddlers will give an Oscar-worthy performance if they think it can get them what they want. 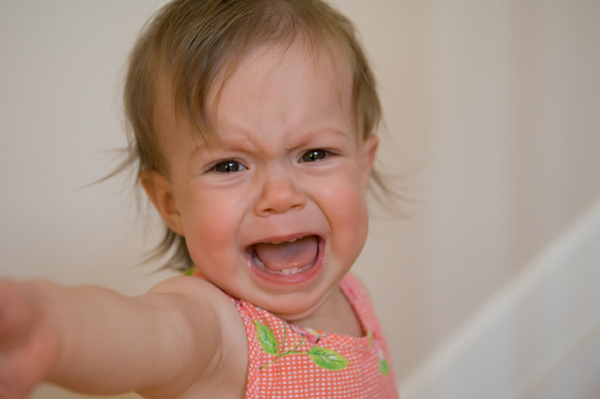 Follow our expert and real parent advice on 5 fast ways to stop a tantrum in its tracks! Most children will start having tantrums at age 1 ½ and will stop having them around age 4 – so how do you deal with these difficult years while staying sane? Do you know you will be waiting at the doctor’s appointment? Lynn advises you to keep your purse stocked with toys to keep them busy. She says to avoid taking kids shopping before mealtime or naptime, or bring food with you so your kids are eating at their normal time. “As much as possible, maintain a regular schedule for meals, naptime and bedtime, even when travelling,” says Lynn. If your child is having a tantrum in a public location, author and licensed family therapist Sharon Gilchrest ONeill, Ed.S, LMFT advises you to pick your child up and leave, showing them their behavior is unacceptable. “Motion changes emotion. We get kids doing another activity and we put out the emotional fire by remaining calm ourselves,” says author and behavioral consultant Kirk Martin. If your child is having a tantrum, Martin suggests starting another activity, like coloring, and asking them to join you — or do something unexpected! Wonder why your child always has a meltdown after a fun, cake-filled birthday party? Blame the sugar! “When the little ones have their emotional needs met, they are much less likely to melt. It is also important for them to have nutritious and protein rich snacks for sustained energy- so they don’t melt down when coming down from a sugar high,” says holistic nutritionist and owner of Ellaflor, Ella Rich. Make sure you feed your child healthy foods and provide nutritious snacks regularly to keep tantrums at bay. When your schedule is packed with activities, kids may throw tantrums because they are feeling overwhelmed and overworked. “Your kids go to bed feeling shuttled from event to event without having their psychological well-being validated. They may, as a result, feel like you didn’t care about them that day,” says Wingate. Not only is it the title of one of my favorite books, but it is also a good reminder on keeping your toddler happy: Eat, Pray, Love. By keeping their physical needs met (naps and nutritious food) and their emotional needs met, you have the recipe for success in keeping tantrums at bay.